What the Heck is a Datil Pepper? Learn all there is to know about datil peppers and their connection to St. Augustine: where to get them, what they're used for, and why they're so awesome! The datil pepper festival is quickly approaching, and many of us are digging songs like "Hot in Herre" and "Drop It Like It's Hot" and "This is Why I'm Hot" out of the depths of our iTunes libraries because—how could we not? The datil pepper is one of the most popular locally grown products in St. Augustine and this festival is completely dedicated to celebrating it in all its spicy glory. The datil pepper is popular in many Minorcan recipes in St. Augustine and is made to create delicious hot sauces, jellies, and mustards sold all over town. The Datil Pepper Festival in October is where local chefs compete and datil pepper enthusiasts from the area sell their best culinary creations. With all the hype though, many are still scratching their heads wondering what a datil pepper is and why it's so important to St. Augustine. This article is sponsored by Old St. Augustine Gourmet—a locally-owned business with an online shop featuring datil pepper sauces and products. What Is A Datil Pepper? A datil pepper is a small hot pepper found in great abundance locally here in St. Augustine. The pepper is a variety of the species Capsicum chinense also known as "yellow lantern chili." The botanist who discovered Capsicum chinense misnamed the plant, believing peppers of this species originated in China. The peppers actually originated in the New World, but the origins of the datil pepper in particular remain unknown. Some attribute their origin to the island of Minorca, saying early immigrants brought them over. Others suggest that the datil pepper shares similarities with an African pepper called a Fatalii, and therefore was brought to America by the African slave trade. Another valid theory mentioned in The Complete Chili Pepper Book by Dave DeWitt and Paul W. Bosland is that they were first brought over by a jelly maker from Chile name S.B. Valls in 1880. That is the earliest mention of datil peppers in Florida that historians can find. The fruit of datil peppers grows to be anywhere from 1/4 inch to 4 inches long, and they are a yellowish orange color when ripe. Many people utilize the datil pepper in their recipes in order to add some kick to their Minorcan chowder or other local dishes. But what makes a datil pepper unique from other peppers? A datil pepper is similar in its heat index to a habenero, hitting at around 100,000 to 300,000 on the Scoville scale--a scale used to measure the spiciness of peppers. But unlike habaneros, datil peppers are sweet, with a fruitful tangy taste to them. Datil peppers are particularly unique to the St. Augustine region. It's very rare that a parcel of land can claim a locally grown delicacy as their own, so the datil pepper in St. Augustine is like what pineapples are to Hawaii...if nobody sold pineapples anywhere else. Although datil peppers can be found outside St. Augustine, it is very rare, and a majority of the datil pepper products sold on the market are used in our restaurants are made from datil peppers grown right here in the nation's oldest city. There's always new vendors popping up at the farmer's market, so you never really know what you're going to get! Because datil peppers grow year-round, they're always available somewhere in town; the problem is finding them. Visitors and locals looking to buy fresh datil peppers won't easily find the peppers at local grocery stores. Instead, hit up the farmer's markets around town. There's the Farmer & Craft's Market every Wednesday at the St. John's County Pier where vendors can be found selling the hot pepper. The Old City Farmer's Market at the St. Augustine Amphitheatre happens every Saturday morning. Farmers can be found selling the datil pepper, and local sauce and jelly makers sell their goods (often with free samples). The Feed Store on SR 16 sells datil plants. For those staying near I-95, the Flea Market on 207 has local produce along with specialty shops selling hot sauces. The only problem (and perk) of the local farmer's market is that the vendors change all the time. You never know what you're going to get, which is a good thing if you're looking for something new, but a bit of a conundrum if you're trying to locate the very elusive fresh datil pepper. My tip: Even if you can't find a fresh pepper, ask a vendor selling sauces or jellies. They may be able to hook you up with some fresh peppers from their harvest. Or, ask a friend! Even in a small office, there's likely to be one person who knows somebody who knows somebody who has a datil pepper plant in their backyard. The datil pepper may be St. Augustine's culinary fingerprint, but the local community is happy to share this pepper with everyone from amateur cooks creating homemade plates to expert chefs creating fine cuisine. Hot Stuff Mon on Treasury Street is ready to help you with all your condiment needs. They have ketchups, hot sauces, barbeque sauces, mustards, jellies and more. Datil peppers are used to make a variety of cooking condiments. 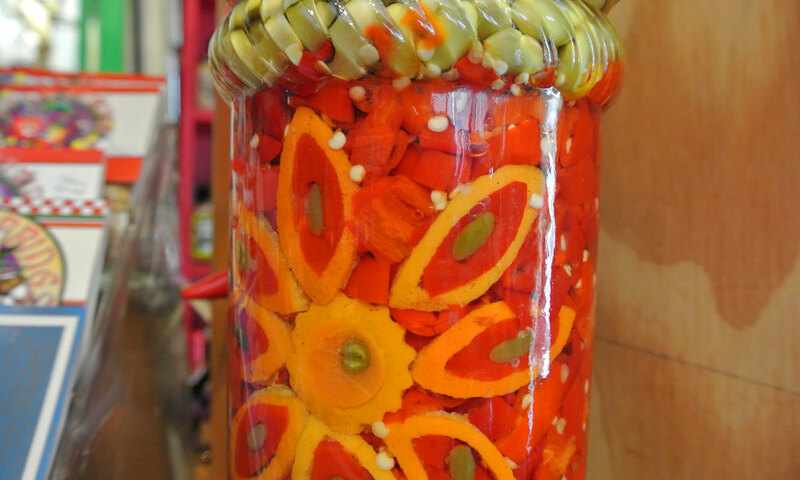 There are datil pepper hot sauces, jellies, mustards, relishes, barbeque sauces, and even pickled datil peppers. 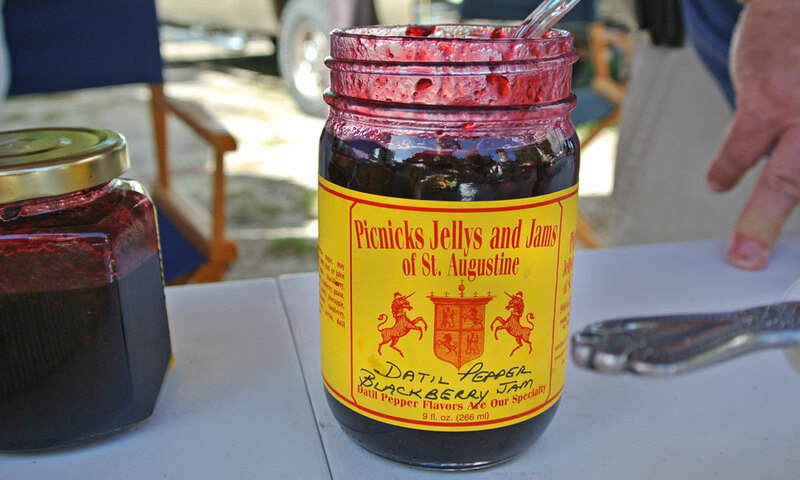 There are several different brands and flavors available in shops, all made by St. Augustine locals, including Datil Dew, A Frame, Cowgill's, Dat'l Do-It, Picnicks, Minorcan Datil Pepper Products, and more. 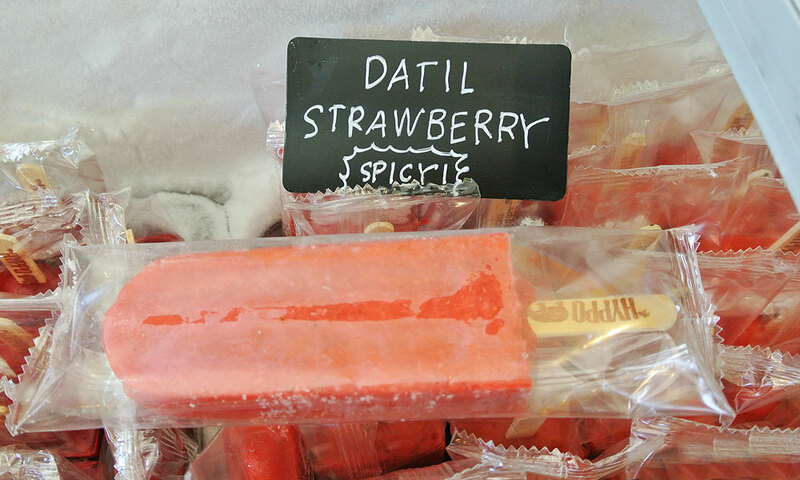 If you're looking to find some datil pepper goodies, check out these local shops and vendors. Dat'l Do-it: If you're cooking up a storm for your visit to St. Augustine in September, or you forgot to add datil pepper hot sauce to your list of touristy souvenirs, fear not! Dat'l Do-It is an online shop selling a variety of datil pepper products, from Devil Drops to Minorcan Mustard. They also sell unique gift sets for the hot sauce enthusiast in your family. Hot Shot Bakery and Cafe: This restaurant shop is located on Granada Street, just steps away from the entrance to the Lightner Museum. Not only do they serve datil dishes, like the Bufis Wrap with sausage, potato, tomato, egg, swiss cheese, peppers, and spicy datil jelly—they also sell Datil B Good pepper products like their sweet Hot Datil Pear Relish and Sloppy Good BBQ Sauce. Just look to the right as you enter, the shelves are stocked with sauces to give your dishes at home the kick they need. Hot Stuff Mon: Located on Treasury Street, this shop offers a very abundant inventory of hot sauces and peppery products. As the largest retail store in the United States selling datil pepper products, they carry all the brands mentioned above, as well as condiments for those who can't handle the heat. Buy some of their datil pepper jelly, mix with cream cheese, and serve with crackers. You'll thank me later. 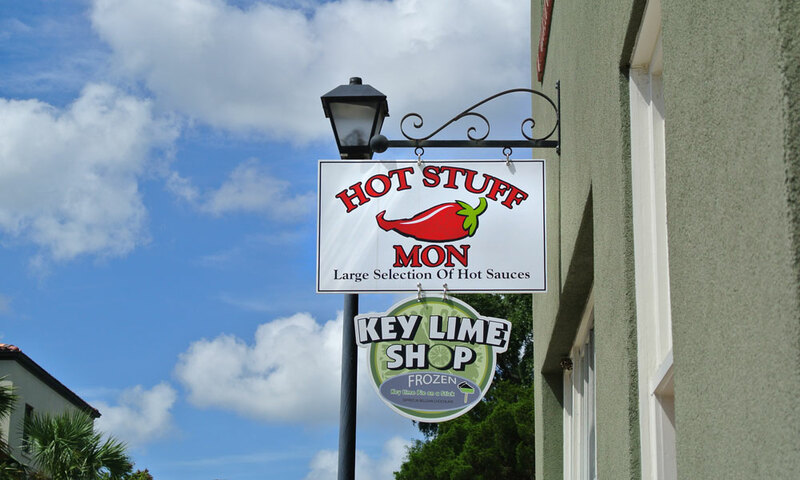 Hot Stuff Mon shares its space with a candy store (Hot Stuff's peppers and cupcakes, Hot Stuff's key lime and hot sauce). Pepper Palace: This shop on St. George Street has an assortment of hot sauces from all over the country. You can even try before you buy with their sample sauces on the counter. In the pattern of combining heat with sweet. Chocolate covered datil peppers in the display case at Hot Shot Bakery & Cafe. Try one and get your photo on their wall as seen in the first gallery image above. Sunset Grille is a St. Augustine Beach restaurant that serves up stunning views of the coastline and the Atlantic Ocean, along with delicious seafood. This award winning-plate was voted as a top entree at last year's Datil Pepper Festival, and is a flavorful, spicy take on traditional Shrimp & Grits. For more info on Sunset Grille, check out our blog post. They say everything taste better with chocolate, and it couldn't be more true than with the Chocolate-Covered Datil Peppers from Hot Shot Bakery & Cafe. These sweet and hot pepper are only $1 each. Try one and get your photo placed on their epic Wall of Flame (get it?!). 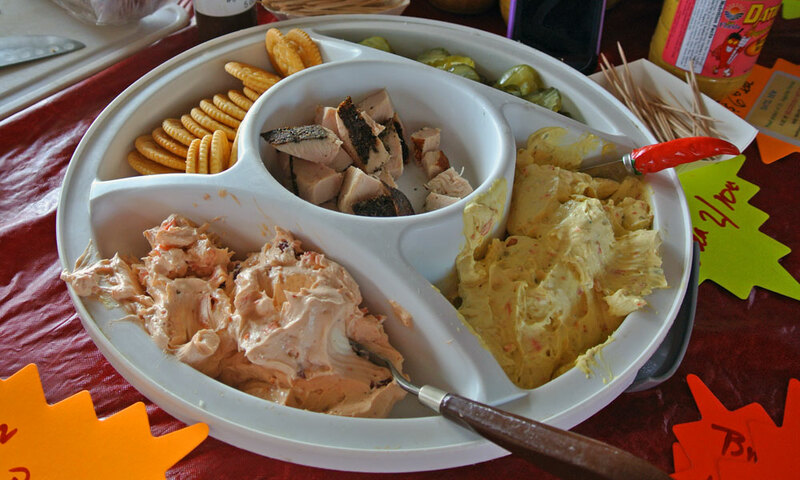 Try this popular game-day appetizer with local flair (or should I say "flare"?). These wings are coated with a spicy and tangy datil sauce giving them a unique flavor you won't find anywhere else in the country. Any recipe that calls for peppers or hot sauce can be made with datil peppers, and there's a ton of them. Here's a recipe (and another reason to get some fresh datil peppers) for datil pepper hot sauce to spice up your dishes at home. It's called Bottled Hell and it's available in the handy souvenir cook books you'll find around town with featured local recipes. Into an electric blender, put 2 cups of chopped datil peppers, and 1/2 cup vinegar. Blend for 5 minutes. Put mixture into a saucepan; add 2 large bottles of catsup and 2-1/2 cups of vinegar. Bring to a boil and simmer for 10 minutes. Cool slightly and pour into small bottles. The datil pepper festival is a place where local pepper enthusiast can celebrate the culinary heritage of St. Augustine. The festival is held at the St. Johns Agricultural Center on SR 16 near I-95. Local vendors and growers of the datil pepper convene at this festival to sell their best datil products (sauces, jellies, mustards...you get the picture). All those things that you add to food to make it taste better will be right there at the festival. And wait, there's more! Local restaurants will be competing in cooking contests and providing delicious datil pepper dishes for heat-lovers to try. Vote on your favorite dishes and see which datil pepper dishes come up on top. The event is family-friendly and features live music performances. Oh, and you know that hard time you had finding those fresh datil peppers; here's an easy solution. BUY A DATIL PEPPER PLANT AT THE FESTIVAL! Yes, in the past years they have been selling datil peppers plants. You can buy a datil pepper plant and grow your own datil peppers, and make all the Bottled Hell you want. The Datil Pepper Festival date is TBA. Admission is free, Tasting Tickets are $1. Datil Do, Pig. Datil do. This article is sponsored by Old St. Augustine Gourmet—a local company specializing in St. Augustine flavors. Check out their online shop and bring a taste of the datil pepper into your kitchen. I like hot pepper so I found some plants at the Ace hardware in Hilliard Fl., But by reading the above about how hot they are ,I hope my mouth can handle them when they make.but I do like to jar up some and use the pepper vinegar . As Content Editor for VisitStAugustine.com, Alex writes and edits everything from articles to business profiles to events. She likes manatees, orange juice, and getting into a hot car on a scorchingly hot Florida summer day after being in AC for hours.